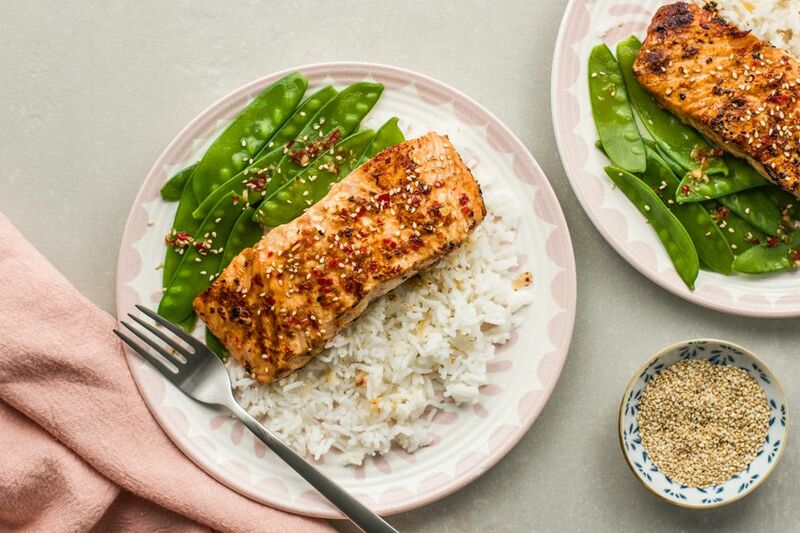 What makes this recipe so special is the tangy Thai lemongrass-honey sauce that marries perfectly with salmon's natural flavors. Pan frying salmon is quick and sears in both the flavors and ​omega-3 goodness of the fish. An extremely delicious recipe that can be made in under 30 minutes, pan-fried salmon with Thai sauce is great for an everyday dinner entree that even your kids will love. Place all marinade ingredients together in a saucepan over medium-high heat. Stir as you bring the sauce to a boil. Reduce heat to medium, and allow to simmer for 10 minutes, uncovered. The sauce will gradually thicken (the smell of the vinegar is rather pungent as it cooks). When the sauce has thickened, place in the refrigerator or freezer to cool for 5 minutes. Place salmon fillets in a flat baking pan so that they aren't piled on top of each other. When the marinade has cooled to warm, slather 1 tablespoon over each fillet. Flip over the fish and repeat, reserving the remaining sauce for later. Marinate in the refrigerator 10 minutes. Place a frying pan or wok over medium-high heat, allowing it to warm up for at least 1 minute before adding the oil. This will help prevent salmon from sticking. When the pan is hot, add 1 to 2 tablespoons oil, lifting and turning the pan to distribute evenly. Now place fillets in the pan. Allow salmon to fry at least 2 minutes undisturbed before turning, allowing it to "sear" so it will come away from the bottom of the pan without sticking. While salmon is frying, cover the pan with a lid. Fry a total of 3 to 5 minutes per side, depending on the thickness of the fish. Salmon is done when inner flesh is opaque and flakes easily with a fork. To serve, arrange salmon on a serving platter or individual plates. Reheat remaining sauce briefly and spoon some over each fillet. Sprinkle with sesame seeds if using. Any leftover sauce can be served on the side. It's also delicious spooned over rice or vegetables. How Do You Make Classic Thai Chicken Fried Rice?